Off and on, throughout the years, I knew Ed Lee. His death at age 65 leaves me in shock. Roy Moore? Special election? Alabama? On this election day, if you’re an Asian American who follows politics, Lee’s passing eclipses it all. You can’t overstate the importance of the death of Ed Lee. He wasn’t just the first Asian American mayor of San Francisco. He was everyone’s Asian American dad. In some ways, he was there to absorb all the stereotypes, good and bad, for all of us. That’s what you expect of a leader. As they say, he was there to represent. And represent he did. As Asian Americans of a certain age, we were both doing things in public view. I was in San Francisco TV as a reporter, Ed was an activist lawyer at the city’s Asian Law Caucus working in the community. When he left to work in city government, Lee rose through the ranks to become the top city administrator, but he was not a politician. He was a bureaucrat. Not a public face. A grinder, not a charmer. When he became the choice of the Board of Supervisors for interim mayor in January 2011, after Mayor Gavin Newsom became lieutenant governor of the state, it was kind of a surprise. And boy, did he like it. As an administrator, Lee was top notch. But being mayor is a different post. You don’t hide behind your desk and stack of files. You are in front of the manila folders. But whenever I saw Mayor Ed, he seemed to like the spotlight just fine.The perks. The attention. The power. Yes, the power. He wasn’t abusive from what I saw. And the issues facing the city were weighty, from homelessness to affordability to minimum wage. It just seemed that despite how hard the job could be, it all seemed to be fun. He was the competent Asian American guy in charge. And he always looked like he was having a great time. I never saw him without a smile. That could be because I mostly saw him at Giants baseball games. As mayor, he was the No.1 fan, reveling in the team winning the World Series three times in six years, twice during his reign. The 2014 Giants World Series parade was my fondest Ed Lee memory. 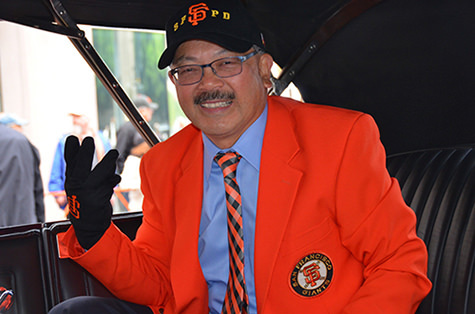 He was in an antique car riding along the parade route that included the team, along with individual cars that had, among others, Rep. Nancy Pelosi and the great Willie Mays. It was raining pretty heavily on the parade that day, making it tough for a reporter like myself walking along the parade route. When Ed saw me, he invited me in for a minute. It was as good a time as any for an interview. Ed always obliged me. There he was, mustachioed, of course. And wearing a Giants cap, naturally. But he had this outrageously loud orange blazer. Dad wear. He was an Asian American making a statement. Ed was Ed, and everyone was happy. The Giants had won a third world championship. What did he say? I don’t recall. But it was just an expression of pure joy, shared by the mayor and a reporter. In the small back-seat area of the antique car, we just looked at each other and knew our common generation stories as Asian Americans. I grew up there, the son of an immigrant fry cook from the ’20s. Ed grew up in Seattle, the son of an immigrant cook fro the ’30s. He went to Bowdoin. I went to Harvard. He went to law school. I went into TV news. I was mayor of San Francisco for a day in high school. He was the actual mayor. A humble public servant who never forgot his roots. And then it was back to the moment. It was raining. And no one cared about anything else.The Giants had just won a third World Series. That will always be my “good memory” of Ed. He was the unlikely politician who loved where life took him, and did well with it. Of course, the transition from bureaucrat to politics wasn’t easy or pretty. And there are other not so great memories. That’s politics you say? Well, Ed learned fast and well enough to win and stay a winner. His election was a showcase of Asian American political empowerment, the likes of which has never been seen in the continental U.S. But it turned into one of the dirtiest elections in San Francisco history. With an AAPI population of more than 30 percent, voters had a choice of interim mayor Lee, Board of Supervisors President David Chiu, Public Defender Jeff Adachi, City Assessor Phil Ting, and State Senator Leland Yee. Five Asian American candidates? Outside of Hawaii, how does that happen? It was a tremendous moment in November 2011, marred by charges of voter fraud and possible election code violations. Turns out Asian American politicians were possibly no less venal and corrupt than any other politician, no matter what ethnicity. Of course, Lee denied any charges of wrongdoing and went about his business. He was developing his political Teflon coat. It was also perfect timing that San Francisco began using ranked choice voting, which made the election a kind of game. Lee won in the end, but to me, it seemed to be less about Asian American empowerment and more about the use of the ranked-choice voting method. Lee took the split-up Asian American vote, but what would have happened if an actual runoff had taken place between the top two? To me, it marred what should have been heralded as an un-asterisked political milestone. But that’s not the insight and revelation I’ll remember most about that campaign. Despite the ranked-choice ascendancy that got Lee elected, the gateway opening was the deal that allowed Lee to go from top bureaucrat to interim mayor. Lee had struck a deal with then Board of Supervisors President David Chiu. In exchange for Chiu’s support to be interim, Lee would not run in November. Chiu believed him and helped engineer the way to put Lee into the position. Then Lee changed his mind about running. It happens, right? Chiu, who has moved on to the California State Assembly, told me Lee said he couldn’t resist the urging of the late Chinatown activist Rose Pak and former Mayor Willie Brown. At the time, I wondered what else couldn’t Ed resist? But all that, as they say, is water under the bridge, and the city has two of them. Ed did his time and, generally speaking, represented us well. Chiu, Ting, and Adachi were there at a city hall press conference today mourning the loss. The political transgressions were forgotten It was all about Ed. But with Ed, we did. We thought it was his good heart. But that wasn’t the case. Ed reportedly died after suffering a heart attack while shopping for groceries. Maybe we could have wished he had gone vegan. After being rushed to Zuckerberg to be treated at 10 pm Monday, he died early Tuesday morning at 1:11 am PT. My condolences go out to his wife, Anita, and his daughters Tania and Brianna. And, of course, all San Franciscans. As a native son, I care about the city. But now I’m in exile, living on the fringe of the Bay Area, observing it for what it is, the Manhattanized playground for the tech wealthy. Last weekend, I went to my old neighborhood with a buddy to celebrate 50 years of friendship. We remarked how practically every corner now had a place to get an espresso, a craft brew, or some handmade delicacy. In our day, they sold different things on the corners. I have to admit that while Ed was steward of the city, I always felt like those of us from “back in the day,” who were born in San Francisco, who had lived and worked there, were still part of its future. The hipsters weren’t taking over the city. Not with Ed the top hipster. Now with Ed’s passing, I’m not so sure. To me, he was “Steady Eddie,” always smiling. And like the Giants, always a winner. At least they were, when he wore that orange blazer and invited me in out of the rain.